City Hall, Bastion of Saint Remy, city view and Caffè Degli Spiriti. 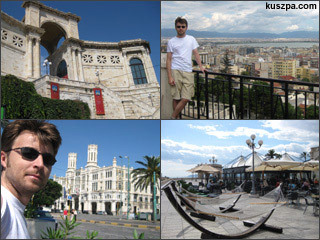 Today I had a city trip to Cagliari, the capital of the island of Sardinia. There was a lot to see; Porto di Scalo, City Hall, Piazza Yenne, Bastion of Saint Remy, Cathedral in the historic district „Castello“, Roman Amphitheatre. Later on I had a break at the Caffè Degli Spiriti at Bastione Saint Remy with a terrific view over the city.